Being Human the North American Second Season Review. Check it out if you enjoyed the previous season or you're a fan of Buffy the Vampire Slayer and True Blood. Although not exactly a household name, Being Human the North American series is based on the excellent UK series of the same name. Although the US series has slightly divulged from the original series, it reminds me of an adult version of Buffy the Vampire Slayer. The North American series also feels more polished and slick than the BBC series but both have their pros and cons. However, the American twist actually works quite well the premise of these three estranged individuals from society. 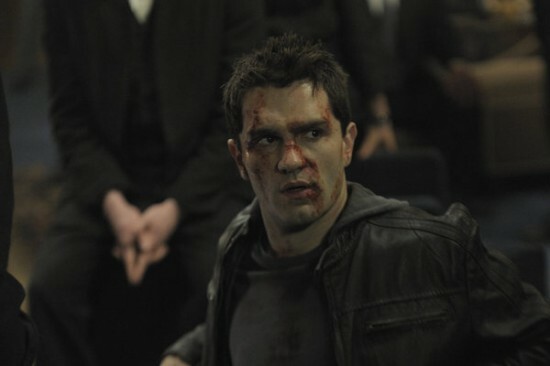 Being Human once again reunites viewers to Aidan (Sam Witwer), Sally (Meaghan Rath) and Josh (Sam Huntington), three supernatural entities attempting to live a normal life in the 21st century. Yet being a vampire (Aidan), ghost (Sally) and a werewolf (Josh) isn't really that normal as we follow these three interesting individuals with intricate stories and relationships with a healthy dose of horror, drama and romance thrown into the fold. Season 2 continues from the events of the previous season with the death of Aidan's mentor, Josh and Nora's miscarriage and Sally who passed on her opportunity in going to the afterlife. The theme of season 2 is once again "humanity" as these three characters attempt to hold onto their origins, even though they are plagued by their supernatural afflictions. My favourite characters in season 2 were Josh and his partner Nora who are both attempting to deal with their werewolf affliction. I also enjoyed the catalyst for Aidan, Suren, a beautiful Vampire Princess who attempts to seduce him back to his dark side. All in all, season 2 flowed quite well and the series once again ends with a bang... literally that will leave fans craving for more. Season two of Being Human the North American Series boasts some good video and audio quality, although slightly lacking from the BBC version. Unfortunately there are no special features in this release but nonetheless if the Americans keep up the production values and hopefully don't go down the same route as Season 4 of the British version, then here's hoping for a very long life of Being Human the North American Series. Check it out if you enjoyed the previous season or you're a fan of Buffy the Vampire Slayer and True Blood.